I am not a huge fan when it comes to hair care, to be honest I think it´s very boring. But I also know it´s important to take care of it so I am trying to learn. 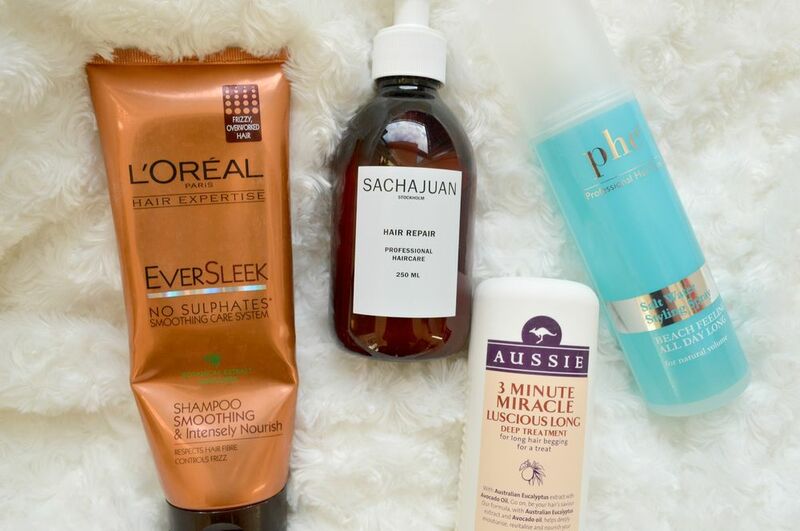 These are the products I love right now for a good hair day. LÓréal Ever sleek schampoo: My mum bought this one for the first time a couple of weeks ago and I was really excited because I´ve heard a lot about Loréal´s hair brand. It did not dissapoint. Now that my hair are just below my shoulders I don´t have to use conditioner every time (it´s heaven! It takes half the time to dry, I don´t need a whole bottle every time and the showers are so fast.) so it was important for me to have a schampoo that´s not stripping. The formula is very moisturising without weighing my hair down and it still gets clean. The price is also a bonus. Sachajuan Hair repair: I´ve heard whispers in the blog world about this brand and I was quite curious to try it out. The smell is not my favorite, I have to admit, it´s very man-like and strong but the way my hair feels after using it ways up all the cons! It´s soft, doesn´t get greasy faster and it feels like it´s doing something not just laying on top of the hair like a coat. This one is also pretty affordable. Aussie 3 minute miracle: Ok, I mostly love this because it smells amazing but it is also great at addind moisture back to my hair, you don´t have to leave it in forever and it´s cheap. I don´t know how well it actually works, but for me it works just fine. I like to switch up my conditioners so I don´t use the same all the time and this is a great addition. Phc salt spray: Now that my hair is shorter I can finally get some volume in it, it´s still a bit hard because it´s so thick but this salt spray doesn´t leave my hair feeling sticky or stiff, it just adds a bit of volume and texture. I also like how cheap it is, a little goes a long way and the mist is very even when you spray it on your hair. The last thing I do to take care of my hair is to do a deep treatment mask maybe once a month and I only wash my hair 2-3 times a week. Dry schampoo is your friend!